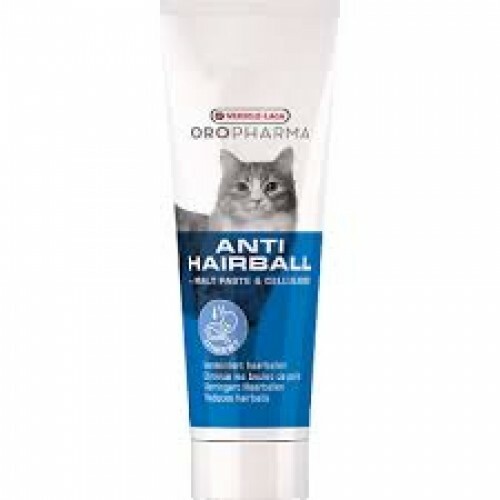 Oropharma Anti Hairball - Complementary feed for cats. As your cat is very hygienic and washes itself frequently, it swallows many hairs in the process. The indigestible hairs can sometimes amass in the stomach and thus form a hairball. That is why your cat sometimes eats grass or nibbles on indoor plants to subsequently vomit a hairball. Anti Hairball is a natural remedy aimed at a good and natural secretion of the swallowed hairs. Anti Hairball prevents the formation of hairballs in the stomach and promotes intestinal transit due to the presence of malt and long-fibre cellulose. Prevents frequent coughing, retching and vomiting. Daily 1 to 3 g (= 2 to 3 cm of paste). Store in a cool and dry place.